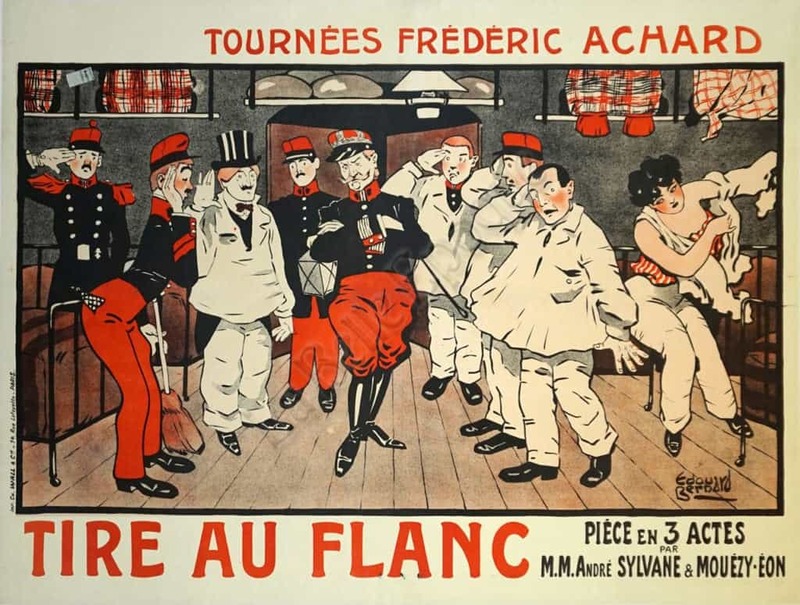 ‘Tournees Frederic Achard [presents]’ Tire-Au-Flanc (or ‘shirkers’, a coward) comedy in 3 acts by M. M. Andre Sylvane & Mouezy-Eon. In the scene, we see soldiers who brought in the lady of the night to the barracks getting caught during an officer inspection. Uh oh! Notice the man in the top hat, or the ladies manager (pimp), with a surprised look. The sad faced (partially dressed) soldiers, fatefully await the sergeants’ reaction to his troops. On the right side, you’ll see the lady quickly getting dressed. The play was later released as a movie in France, 1928, retitled ‘The Sad Sack’.